While there are many upgrades that one can make to their home, some of them provide more benefits than others while certain improvements are simply more fitting to a homeowner’s wants and needs. If you are looking to enjoy multiple benefits from an upgrade, you should consider sliding glass doors. It is hard to deny that sliding glass doors look good, but the great thing about them is that they fit well into most styles of homes, making them a versatile upgrade. In order to get one that meshes well with your home, you can make changes to the frame material, thickness, fittings, and design. An understandable concern is safety, but this is nothing to worry about because sliding glass doors use shatterproof glass, thus ensuring they are safe even when a rough encounter occurs. With how much natural lighting you can get with a sliding glass door, there is no need to rely on artificial lighting throughout the day to get enough lighting. It might not make a substantial difference, but over the course of several months or years is when you will see noticeable savings. If you have children or seniors in your home on a regular basis, you will find that sliding glass doors are rather nice because they are so simple to use and easy to open and close. It is not something that people have to struggle with, which is a great and often overlooked quality of sliding glass doors. If you are interested in getting sliding glass doors for your home, contact us today. If you want to make a drastic difference in the appearance of your bathroom, it's helpful to browse through the different styles of shower doors that utilize glass due to its modern appearance and easy-to-clean quality. While a shower curtain may be the cheapest solution for showers, they generally lack in style and value compared to shower glass doors if you want to make a purchase that will increase the value of your home. “Glass doors are almost always preferable,” is the opinion of interior designer Jessica Helgerson, as printed in The New York Times. By opting for glass doors for a standalone shower or a bathtub and shower combination, you can add quite a bit of value to your home during a remodeling project. 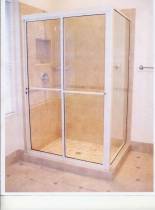 Besides the value of glass doors, many homeowners find this type of enclosure for showers to be appealing due to how easy it is to clean. Shower curtains can often trap quite a bit of moisture in the creases, often resulting in significant wear and mold occurring. By installing a shower door that uses glass, the user can generally just wipe down the door with a shower cleaning tool. The task takes only takes seconds and should result in your bathroom looking much nicer than with a shower curtain. Glass panels and doors can fit into a variety of decorating schemes, allowing you to make an investment that will help improve the appearance of your bathroom for years to come. This can be especially appealing since it will ensure that your home will be attractive to future home buyers since they should be able to put their own special touch on the bathroom since glass doors are very neutral. For more information regarding the benefits of glass doors used for bathrooms and the options that we have available, we invite you to contact us. It can be difficult to know what style or finishes best suit your needs when doing a bathroom renovation. With the many different types and options to choose from, a project that seemed exciting in the beginning can quickly become a burdensome task. Low Maintenance: This will be an investment that will offer you low maintenance and repair. By choosing a frameless shower enclosure, that means you will have fewer metal parts to collect grime and rust over the course of your shower's lifetime. Easy Cleaning: This is such a wonderful benefit to choosing a frameless shower enclosure! Framed or frameless, glass is very easy to take care of and clean. Bathrooms have the potential of being one of the dirtiest rooms in your house, so it's nice to be able to cut off some of your cleaning time with the shower area. Rust-Free: This is especially the case if you choose a frameless shower enclosure. With the lack of metal used, the chance of rust and mildew decrease exponentially. This will also help your shower keep the look of newness over time, and will help with the resale value of your home down the road. If you are looking for a professional team of shower enclosure experts and installers, check out Hutchinson Glass & Mirror. The oldest, independent, family-owned glass fabricator/retailer in the Washington metro area, Hutchinson Glass & Mirror is able to answer any questions you may have. Please, do not hesitate to contact us for more information. Or, hop on over to the blog for some more great tips and answers for any and all of your glass needs! By using a glass top on your coffee table, you are able to easily highlight any area rug you have underneath. Typically, the eye catches the coffee table first being as it sits higher and closer to eye level. By allowing part of the table to diminish without losing style, you are making room for more elements of your room to shine through. You can easily make your own coffee table using a glass top. Depending on what type of base you use, you can purchase your cut of glass and get the exact style you are trying to achieve by accomplishing it yourself. Glass is very easy to clean. As opposed to wood or other standard coffee table materials, glass is easily kept sanitary and stain free. When using glass, you are able to have a completely unique base to hold your table top up. Typically, bases are not seen and therefore forgotten about. With glass, the base can be more of the focal point and add creativity to your space. If you have some more questions regarding glass or table top designs, check out Hutchinson Glass & Mirror. Hutchinson Glass & Mirror is a family managed and produced company that specializes in the highest quality design, production, and installation of any of your glass needs. Please do not hesitate to contact us with any questions you may have. Or, hop on over to the blog for some more great tips and information on how to get started on your glass project today! Glass surfaces can be a welcome addition to any living space since they have a timeless look and can be so easy to clean. If you’re interested in glass table tops for your dining room table or living room coffee table, it’s important that you take your time selecting a table top that will work well for your needs. From choosing the right thickness of the glass to different transparencies, take the time to consider the following. The thickness of the glass plays a large part if how sturdy the table top is. In the event that the table top is impacted, it can be so reassuring to know that the glass is thick enough where it won’t shatter. Thicker glass is also less likely to be scratched, making it a good idea to look into the options for thickness. While many people look for glass table tops that are as transparent as possible, this may not be a good idea if you’re concerned about your dining room table being clear. Comparing your options can help give you a clear idea of what transparency would be good for wherever you’re intending on using the table top surface. With so many variations for table tops made of glass, it’s crucial that you consider what your own personal use will be. By knowing how you plan on incorporating this surface in your home, you can be confident that it will last in the years to come. Feel free to contact us if you have any questions regarding glass table tops and their use in your home. If you have decided that you want to improve your bathrooms and new shower doors are in your plans, you can guarantee a positive experience by using professionals for fabrication and installation. After you meet with a professional, decide what you are going to have done, and schedule an appointment for the installation, you should focus on preparing your home for the day of the installation. It is essential to create a clear pathway to each bathroom in your home. With shower doors that are both heavy and delicate, all it takes is one little mistake for them to get damaged or completely shatter. If this means you need to remove some furniture, it is better to be on the safe side. Another obstacle that professionals might have trouble with is pets and children. Although you might be able to keep them out of the way just by telling them, the safer option is to get them out of the home. Since the work will be happening in the bathrooms, you need to make sure that each bathroom is clean. Removing everything that you normally keep in the shower area and clearing up enough space for a professional to move around in the bathroom is essential for a problem-free installation. It is ideal to not make a professional carry shower doors a long way just to get in your home. Whether you move your car out of the driveway or reserve a nearby parking spot on the curb, the closer a professional can park, the less distance they have to travel to get your shower door safely inside. If you are interested in new shower doors, contact us today. Here at Hutchins Glass and Mirror, we have a beautiful selection of etched glass to add to your collection at home. But do you know how your etched glass was made? There are several methods used for etching, each creating a slightly different effect. Acid etching uses the colorless chemical called hexafluorosilicic acid combined with several other chemicals that are all heated. Acid etching results in a frosted look. It became popular in English pubs during the 1800s, because the frosted glass prevented people from looking in, but still let in natural light. This is a simpler method than acid etching and popular among hobbyists. The cream is made up of chemicals that, when combined, lightly eat away at the glass parts it contacts. Glass etching cream is best used on smaller surfaces because the etching often comes out uneven. This method creates deeply etched designs and is good for larger surfaces. High pressure air mixes with sand to etch out the glass. This method is often used commercially. The mold etching technique emerged in the 1920s and became popular during the Great Depression because the simplified process meant a comparatively low cost. This technique consists of etching directly into the mold so that the glass emerges with texture already in place. Etching is done using a variety of techniques, each leading to a unique piece of glass. If you're interested in learning about the etched glass here at Hutchins Glass and Mirror, please contact us. Choosing desks for children’s rooms can be difficult on many fronts. For one, kids’ tastes change like the wind. One minute they’re in love with Winnie the Pooh and the next they’re all about Justin Bieber. As a consequence, many desks bought when they are in kindergarten or elementary school many not transition well into high school and college years. So, what are the options besides buying new desks every few years? May we suggest investing in glass top desks? Glass top desks are durable, timeless and gender neutral. Therefore, kids are less apt to outgrow them when compared to other types of trendy desks. Furthermore, they’re one piece of office furniture that will continue to fit into a home’s interior design long after the kids have moved out. Plus, glass top desks are extremely customizable. So, making sure junior has enough writing and storage space isn’t going to be a problem either. In addition, ink blotters and other accessories can be customized and swapped for others in a moment’s notice. Therefore, the kids could even change the look of their desks to match the season. And if you are worried about safety, don’t be. There are a handful of shatter-resistant materials on the market today. Ones that come to our minds are armed, tempered and laminated. However, not all of them are suitable for making children’s desks. With that in mind, the two types that tend to turn up most often are tempered and laminated. We can explain more about them when you call, e-mail or stop by. So, to learn more about choosing glass top desks for children’s rooms, please contact us at Hutchinson Glass & Mirrors. 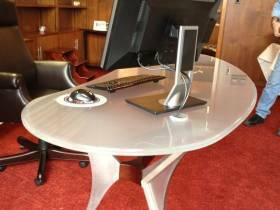 We are experts at fabricating glass top desks for industrious people of all ages and initial consultations with our team are complimentary. In the summertime, there is nothing that beats the view from sliding glass doors. This is especially the case with those that are accompanied with fixed panels to increase the total viewing area. However, some people still worry that sliding glass doors have more cons and pros. We’re here to tell you that with close attention to details and today’s glass sliding door materials, nothing could be further than the truth. Sliding glass doors are often manufactured using strong, rust-resistant, air tight materials and specialty glass. The specialty glass is generally designed to accommodate specific U-factors and R-values commonly associated with regional areas. As such, the risk of condensation formation, energy loss and storm water leaks are 100% lower than they were in the 70s, 80s and 90s. In addition, the tracks the sliding glass doors rely on are much stronger than they were just a few short years ago. And they don’t get hung up on as much as they use to either. Consequently, property owners don’t have to worry about trying to unstuck sliders or hang them back on track every other day or two. Also keep in mind that if modern-day, glass sliding doors do get knocked off of their hinges, they’re lightweight. As such, correctly the problem will barely create a sweat. Furthermore, the locks on sliding glass doors tend to be a lot stronger than their predecessors as well. Plus, oftentimes they can be tied into smart home security systems that send property owners and police departments’ alerts at the first signs of an attempted break-in. We’ve even seen contemporary sliders outfitted with motorized window treatments too. Therefore, they are super easy to operate from afar. Simply press a button, turn a knob or punch in a code and the window treatments will respond accordingly. 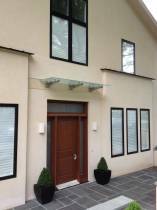 To learn more about glass sliding doors and have a set custom designed to your complete satisfaction, please contact Hutchinson Glass & Mirror. Go with a two-tier table to maximize surface area, with a glass top tier. You can use the glass table top as a conventional coffee table; it can hold coasters, a candle, photographs, a book, or simply leave it spare if that's what you prefer. Get creative with the bottom tier. Fan out those back issues of your favorite magazines that have been accumulating dust in the corner. You can also pile books if you're short on bookshelf space. For those who like to buy items in bulk but lack storage space: find a straw or fabric box for your extra items, and make sure it has a lid. Place the box on the bottom tier. If the box is shallow enough, it's like creating a third tier. You can still place books or magazines on top of the box. Get a round box for a square table, and a square box for a round table. Your glass table top will reflect whatever is placed on the surface. This gives the illusion of a more spacious living area. If you're worried that placing a coffee table in a small living room will feel cramped, the illusion of less density will help. Customizing glass table tops are easy and common, so you can create a table that is perfect for your space. Customize your table to fit the exact length of wall nook, or fit perfectly in the center of your seating arrangement. At Hutchins Glass and Mirror, we can help you find the ideal glass table top for your home. Contact us to get started. If you are looking to make some changes to your bathroom to increase its safety, your shower is an important area of concern because showers get used so often. It is vital for it to be a safe experience to avoid getting injured while showering or trying to get in or out of the shower. With this in mind, you will find that glass shower doors are the safest choice. Installing a low clearance or walk-in shower means you need to have a shower door, as opposed to shower curtains that generally work best for bath and shower combinations. Having such a low clearance shower makes it a lot safer to get in and out, which is very helpful for those that are no longer able to safely step into a shower with a fairly high clearance. When you get a glass shower door, the tempered glass that it is made from keeps it very strong, which also makes it durable enough to knock into or lean on to get some stability without a problem. It is not possible to lean on a curtain, and you never know when you might need extra stability. Another benefit of glass shower doors is that you will not have to spend as much time or have a tough time with cleaning. For instance, you can apply a polymer coating, which inhibits mold growth, and you can use a squeegee with a long attachment to clean the shower door after taking a shower. For safety reasons, a glass shower door should be your top choice. Contact us to discuss your options for getting a new shower door. Did you know that glass top coffee tables are not only beautiful; they can give cramped living quarters the illusion of space and more? It’s true as long as they’re designed with spatial concepts in mind. In art, space is conveyed in many ways and similar may be said for coffee table designs. The most common methodologies involve color, size and overlay as well as linear, two and three-point perspective. The list of other methods includes, but isn’t reigned in by concepts like spatial complexity, constructed space, textures, atmospheric and amplified perspective. Let’s take this see-thru trunk on Pinterest as a prime example. Despite being large and functional, it doesn’t seem to overcrowd the living area. That’s because it’s see-thru of course. The items strategically placed on top of the glass trunk and the glistening, gold hardware also seem to be floating in the air, which adds something more to the space. Undoubtedly, it isn’t the only way to use glass to create an illusion in the living room. For proof, check out this glass river tabletop and galvanized tub table, also found on Pinterest. Just imagine how stunning the glass river table would look placed on top of a deep blue carpet or other flooring that sports a water-colored hue. As for the glass-topped bucket, that would look good in a number of settings too. At Hutchinson Glass & Mirror, we can help take whatever inspires you and turn it into a glass top coffee table that fits perfectly with your plans. So, it doesn’t matter if you want your coffee table to look like a seaman’s chest, raging river or tiny garden. 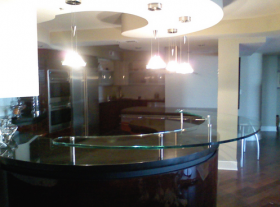 We can provide glass fabrication and installation services that will suit your needs. To speak with one of our expert fabricators and convey your glass top coffee table plans, please contact us online. Consultations with our glass top coffee table fabricators are complimentary and available year round. Adding wall mirrors to an apartment can be an excellent way to imitate the look of larger space, brighten a room, and add an attractive feature to your home. While wall mirrors come in all sizes, they all need to be hung carefully to avoid damaging the walls of your rental space. To get started with hanging a new wall mirror, consider the following tips. While smaller sizes wall mirrors can be mounted almost anywhere, it becomes a bit more challenging when working with heavier mirrors. In order for a large mirror to be mounted without damaging the walls, you’ll need to use a stud finder to locate the sturdy beams to hang the mirror from. Anchor screws are one of the best ways to ensure that you’ll be able to hang heavier mirrors without any worry of them slipping from the wall due to their weight. In fact, some of these screws can support well over 40-pounds, allowing you to hang mirrors of all sizes. If you’ve had a wall mirror hung for a long time and you’re ready to remove it, either due to a change in interior design or you’re moving, it’s important to be careful while removing the mirrors. After taking down the mirror, you’ll need to slowly remove any screws and mounting to avoid damaging the walls. Wall mirrors can look wonderful in an apartment, but you’ll want to be careful during the mounting so that your apartment walls are kept in great shape. If you’re currently on the market for a wall mirror, feel free to contact us. When looking for a desk that can help maintain a minimal and clean finish in your office space, glass surfaces remain to be one of the most popular options. Not only does a glass top desk help keep a space looking airy, it can also help draw attention to artwork or electronic gadgets in the room if you would like. In order to keep your desk pristine, look into the following tips. Clutter can quickly make a space feel messy and make you unproductive, as a result. In order for your desk to stay neat, buy some organizational tools for the desk and surrounding shelving. Small boxes and bowls can help store everything from excess printer ink to paper clips. Cables can make a space feel chaotic, making it a good idea to choose wireless electronics. For things such as a wired keyboard and mouse, you’ll want to buy cable management tools to keep all these cords tucked away underneath the desk. The surface of your glass top desk can quickly become smudged and looking messy if you’re not careful. To keep the desk looking great, you’ll want to keep some wipes or spray cleaners nearby to wipe away any smudges as soon as they’re noticed. This will help keep the desk looking as clean as possible and ensure that your office looks neat. If you’re interested in purchasing a glass top desk for its modern and minimal appearance, please feel free to contact us to hear more about our selection. Although some property owners may decide to avoid fitting into any one particular style with their rental property as to avoid turning off potential tenants from being interested, investing in a modern look is generally a safe bet due to how desirable it is as a style. From aluminum-framed windows to good lighting throughout the entire home, there are many ways to achieve a modern look, and adding frameless shower doors brings you closer to reaching this goal. Even when you lose a few tenants that are not interested in a modern home at all, the fact that you will simultaneously increase the interest of others, especially knowing that these individuals are willing to pay more on the monthly rental rate to get their hands on a modern rental property makes it worthwhile. Frameless shower doors look great, and they make bathrooms look clean, open, and organized. It is especially important to keep an organized bath and shower when you have these doors as a clutter of shampoo, conditioner, and body wash bottles can have a negative impact on the overall look. However, when showing to potential tenants, your rental property’s bathrooms will look amazing. It is understandable to be concerned about safety issues, especially with such a large piece of glass that will consistently be opened and closed on a regular basis. Fortunately, these doors have tempered glass, which make it difficult to break, and thus giving you the confidence you need to invest in them. 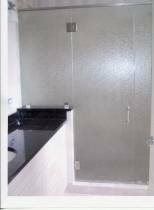 If you are looking to modernize your rental home, contact us to learn more about frameless shower doors and how this addition can help you in accomplishing your goal. Whether you’re looking into purchasing glass table tops for a dining room table or living room coffee table, you’ll benefit by getting a large surface that can look great in places big and small. Many people are drawn to the look of glass tables due to their minimal appearance and ability to fit in nicely in smaller places. In order for you to be as satisfied as possible with your glass table, look into the following ways to use it. Most glass tables contain a panel underneath the glass for items to be slipped. A clever way to personalize the table is to display some favorite photographs. Changing out the photos throughout the year can help add some personal art to your home and be easy to care for. If you would prefer something a bit more traditional, you may want a favorite color or pattern to be displayed under the surface. For this reason, you may want to look into getting wallpaper to lay out underneath the table. From seashells to bottle caps, the glass table top can be ideal for placing a small collection underneath. Any items that are short in height can fit in nicely underneath the table, making it a good idea to look into which items you enjoy collecting and would like to put on display in your home. 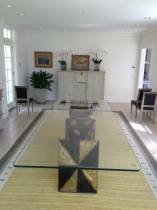 Taking care of a glass table requires some effort for it to stay streak-free and to avoid any cracks, but the unique appearance is worth the amount of care. If you’re interested in buying glass table tops for your home, please contact us. It refers to shell work that first appeared in the early 1700s. By shell work, we are referring to images that resemble marine crustaceans. They were used a lot throughout the country as well as by designers in other regions, like Germany, England, Spain and Italy. The shell designs added to the etched glass designs varied but they were often found in similar places. The list of places includes, but isn’t constrained to churches, grottos, castles and manor houses. Sometimes the shell imagery was paired with representations of other items found in the natural world. For example, they may have been placed alongside of sea grass, leaves, reeds, water lilies and other flower blossoms. Other times, they may have been carved next to marine mammals, mermaids and mythical sea creatures or Deities. So as you can see, it is possible to come up with a wide variety of etched glass designs and still have them fit into rooms decorated with Rococo-style furnishings. At Hutchinson Glass & Mirror, we can help buyers come up with inimitable, etched glass designs for their homes or work spaces. The designs may be ultra feminine, completely masculine or gender neutral based on buyers’ preferences. With that said, to speak with an etched glass expert about having a custom piece manufactured for Rococo-style interiors, please contact us today. At first blush, it may seem like there’s not much to say about the materials used to make glass table tops. After all, it’s glass right? Well, as long-time glass table top manufacturers, we can tell you that nothing is further from the truth. Although glass has been around commercially since before 2000 B.C., it has changed much over the years. This is especially the case when it comes to the glass used in table manufacturing. Not just any old piece of glass can be used to make table tops. It has to be strong, thick and shatter resistant or shatter proof. This knowledge was gained over time and used to perfect glass table top offerings. For example, in the 1960s, interior designers liked to use glass mixed with iron oxide to make table tops because of its aesthetic value. Before that time period, people liked to use everything from mosaic, lead crystal and sheet to frosted glass. Today, glass table top standards are set by ASTM International. Their standards are designed to help keep consumers safe. As such, they dictate that safety glass should ideally be used to manufacture glass table tops. It is widely considered to be the best material to use in furniture production because it doesn’t shatter like untreated glass. Plus, it can be just as attractive as decorative glass. Nonetheless, we have seen table tops made with annealed glass, which shatters differently too. It has a tendency to break into big, sharp, triangular pieces whereas safety glass does not. It tends to break into dull, small rectangular or square-shaped pieces. Thus, it is less apt to cut people in the event of an accident. To learn more about the different types of glass and how it is fashioned into custom table tops, please contact us today. We have been working with all sorts of glass for over 90-years. Custom and standard table top work is just one of our many fabrication specialties. We also do installation work and introductory consultations are complimentary. While many people think of large pieces of artwork when they begin to look into getting a focal piece for a wall, a mirror can be a stylish alternative. Not only do wall mirrors come in a large variety of styles, they’re also able to reflect light to help encourage natural light in your home. In order for you to be happy with your new focal piece, consider the following tricks for wall mirrors. The height that you hang a mirror at can make a big difference in the statement it makes. While you want the mirror to be eye-level, that can be difficult when working with a large mirror. Trying out different placements before hanging can ensure that you’re happy with the positioning. One of the best parts of using a wall mirror as a focal piece in your home is the endless options for frames. Taking a look at the different wall mirror frames with the rest of your homes style in mind can help a lot in leading you towards mirrors that will fit right in. The reflection of your new wall mirror can make a big difference in the final look. It’s recommended to get some natural light reflecting in the mirror, along with avoiding any clutter in the reflection. If you’re trying to use a wall mirror as a focal piece, you’ll need to take special care regarding the size. It’s often best to go for the biggest wall mirror possible so that it can be eye-catching and stand out in a room. If you’re interested in purchasing a wall mirror for your home, please contact us. With all the different types of countertop materials to choose from, it can be difficult to choose the perfect finish for your home. Quartz, granite, laminate, wood, metal and marble are the materials that generally come to mind, especially for kitchens. However, these aren't the only types of materials, glass is also used to great effect. 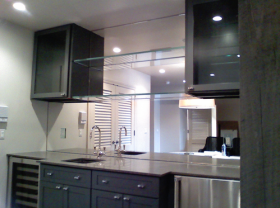 In fact, for both kitchens and bathrooms, glass countertops are one of the best options, for a variety of reasons. In the past, the most elegant homes were often outfitted with granite or marble countertops. These materials are considered high-end luxuries that last. Today, glass countertops share the stage with these materials, and they are showing up in some of the most beautiful homes in the world. Although they are completely functional, they are also unique pieces of art that express the good taste and individuality of the homeowner. With a plethora of textures from smooth to wavy to bubbled and anything else you can think of. In fact, it is so flexible, you can easily create a stunning look with this simple material. You can combine different types of glass, in any color you like, layer it, or use a single color. What's more, you don't have to settle for a straight-edged countertop like everyone else. Glass can be formed to curve and bend in ways that other materials simply cannot. That means you can design a one-of-a-kind countertop that no one else will ever have. One of the coolest things about glass countertops is the variety of ways that they can be lit. Some people prefer to light the glass with colored lights from within. Others use task lighting to shine down on the countertops to enhance the colors and textures within. These approaches are great for kitchens and bathrooms alike. Another idea is to combine glass countertops with glass-fronted upper cabinetry for a bright, open kitchen design. Even without special lighting techniques, glass reflects light and gives the room a lighter feeling than marble or granite. Glass naturally resists bacteria, making it an excellent choice for kitchen and bathroom countertops. Nothing will permeate the surface either, so you won't have to worry about stains from food or other products ruining your new counters. It's a simple matter of wiping up any spills and they instantly go away. Even better, you never have to worry about sealing the surface like you do with other countertop materials because glass stays non-porous forever. If you're considering glass countertops for your bathroom or kitchen, congratulations, you're making a good choice. If you need any help along the way, please don't hesitate to contact us. We'll be more than happy to answer any questions you and we'll help you choose the right glass for your application. Working from home is something that a small percentage of people experience, and with self-employment comes the need to have a place to work at home. In this case, you need to have the right furnishings to be as productive as possible, and one piece that is often used is a desk. Although new furnishings are not necessarily going to make you do your self-employed work, a glass top desk can help you accomplish these goals by providing numerous benefits. Whether you have a large office or a small corner in an extra bedroom, a glass desk can be custom-sized to meet the exact measurements that you have to work with. It is a wise investment because a glass top desk will give you as much desk space as possible, but without taking up too much room. Depending on the décor of your workspace, a glass desk can either fit in great or not well at all. For modern workspaces, a glass top desk is one of the best choices available as it adds to the overall look. Although a traditional-styled home may not match perfectly with a glass top desk, you can still benefit from the fact that this type of desk makes the space feel a lot larger than it is in reality. If you move your computer around frequently, or you know that you will be moving in the near future, a glass top desk is an excellent option because it is made of lightweight material, but is also quite sturdy. Planning out a glass top desk can take a long time for your home office, so contact us and let us help you make the best decision based on your particular wants and needs. Sliding glass doors have become a popular option for households here at Hutchinson Glass & Mirror, though we know that many people like to customize with the glass door concept. We've had some customers who've enjoyed customizing their homes to a point where a glass door and walls become an unusually fashionable choice for a room. And it's something we can create for you if you've had a similar idea while designing the interior of your home. How can a glass door and walls partitioning a room work in interior design? You might be surprised at how effective it can be, especially when you have valuable things in a room you don't necessarily want people being close to. Collectors of antiques or other valuables might want to build a small room with a glass door and walls so visitors can see the items in the room without getting up close. Since those items are resting on shelves, you might have kids around during a gathering that could otherwise mean something falling off and getting broken. With the glass walls, you can showcase those items without worry of something being damaged. By locking the glass door, you can also keep anyone from walking in. In that regard, it almost works like window shopping. Perhaps you want a room where you can go work while still wanting to keep an eye on your kids or other parts of the house. With a room utilizing glass walls, you have a sound-proof area while still giving you a chance to watch your kids playing in another room. It's an idea that should arguably be incorporated into offices rather than cubicle walls. Along with customization, you can easily add a curtain to the glass walls to use during times when you really do want privacy. Contact us here at Hutchinson Glass & Mirror to find out more about custom projects like this and so many more variations. Ideas are limitless when it comes to using glass and mirrors in your furniture and home design. Let us show you how effective it can be in bringing something different. When remodeling your bathroom, there will be many decisions you will have to make. From fixtures to design elements, you will have to decide which pieces will work best with your new layout. One such decision you will have to make will be in regards to what type of shower doors you would like to have installed. If you are unsure what option will work best in your bathroom, here are just a few of the benefits of using frameless shower doors for your new shower. One of the greatest benefits of upgrading to frameless doors for your shower is the beautiful, modern look it can bring to your bathroom. The sleek, elegant look these doors can bring will be the perfect complement to your newly remodeled bathroom. If you have yet to have frameless shower doors in a home in which you have lived, you will be astonished by the extent to which removing these doorframes can enhance the look of your shower. Anything that adds to the look and modernity of your home can help to increase its value. Frameless shower doors can not only increase the value of your home, but they can also help your home to look more appealing to prospective homebuyers, which can make it easier to sell. This can make frameless shower doors a sound investment in your bathroom remodel. Another benefit of frameless shower doors is that they are traditionally much easier to maintain than framed shower doors. This is primarily due to the fact that there is no track and frame in which dirt, grime, and calcium can collect. This can help to reduce the steps necessary to clean your shower. Furthermore, these tracks can begin to deteriorate and corrode over time due to water exposure, which can cause these elements to need to be replaced. Thusly, frameless shower doors can save you money and hassle over time. Of the many decisions you will have to make during your bathroom remodel, the choice for your shower door should be the easiest as there are numerous benefits of frameless shower doors. Contact us to find out more about the benefits of frameless shower doors. Etched glass first emerged in the mid-19th century as a way to hide patrons in pubs while still allowing natural light to enter a drinking establishment. It wasn't long before Edwardian and Victorian homes took on this idea with glass etchings appearing on everything from mirrors and windows to glassware. Glass etchings continue to be a popular way to decorate windows and mirrors. This technique involves scraping or scratching a piece of glass in selected spots to create interesting designs. As a result, frosted designs are produced on glass. If you’re considering glass etching for a window or mirror, here’s what is involved. Unlike decals or frosted mirrors, an etching doesn't peel, fade or flake. Regardless of how often you clean your mirror, the design or image won’t change its appearance as it’s permanent. However, its look can be affected by the angle in which it’s viewed and the light in a room. Although it’s not truly three dimensional, a glass edging does have more than two dimensions when looking at it. One of the most common glass etching is a leaf border. This is done by repeating a design around the perimeter of a mirror. Besides being attractive, a leaf border can make your mirror look as if it’s framed. There are countless designs from which to choose. Some of the more popular etchings involve logos, family crests and military patches. Surface etching—This technique involves only etching the surface of a piece of glass. The designs are black and white (positive and negative). While the etched portions usually appear white, the unetched, or clear, parts of a design look dark or black. It's the easiest one to do, besides the quickest. Carvings—In carved etchings, your image is carved or blasted into the glass, which gives it a more three dimensional appearance. Carvings can be done in one, two or several stages. They render a more sophisticated look than surface etchings. Glass mirror etchings are one of the many services offered at Hutchison Glass & Mirror. To find out more about how we can serve you, please contact us. Don’t set glass topped tables near heat sources or in unheated rooms. Otherwise, as you’re cooking Thanksgiving dinner, the rapid changes in air temperatures could cause stress to build. And like anything else, when stress builds to a certain point, it could cause cracks or a total breakdown to occur. Do remember to avoid placing very hot or cold plates onto glass table tops too. Those types of temperature extremes may create stress as well. Therefore, it is always better to use temperature resistant items to separate the dinnerware from the glass table tops (e.g. coasters, rubber footed trivets and thermal mats). Similar maybe said for drinking glasses that have a tendency to sweat. They could cause the glass table top to develop hard water marks or other types of discoloration. If that does happen, act quickly and try to remove the stains from the table using Lemi Shine® Detergent or full strength, white vinegar and a lint-free, absorbent cloth. Don’t place salt blocks, plates or slabs directly onto glass table tops either. Invest in a piece of butcher block or a corrosion resistant plate that can cradle the blocks or slabs during Thanksgiving dinner service. After all, salt is very corrosive and is frequently used to etch glass. So placing a salt block onto the table could actually mar the glass surface and weaken it all the way down to the core. To learn more about making stunning, glass table tops a focal point during your next Thanksgiving dinner, please contact us at Hutchinson Glass & Mirror today. After you spend money on getting a new shower enclosure, you might be thinking about how you can make it last as long as possible. Being careful will prevent most accidents from occurring, but you need to be diligent with your cleaning efforts to minimize difficult cleaning and to maximize longevity. A simple purchase that can be made and have an enormous impact on shower enclosures is a squeegee. After you or anyone else takes a shower, a squeegee should be used to get water off of all surfaces. While the most important part to clean is the glass to avoid water spots and mineral buildup, you can use a squeegee on just about every surface within your shower enclosure. While cleaning your shower with a squeegee will do the trick for a while, you will still need to clean the shower enclosure on occasion. However, you can make it easier by using a glass protector, which acts as protection against water spots and minerals that may cause damage when left alone. In order to clean a glass shower enclosure properly, you should avoid using cleaning supplies that will give you more problems than solutions. For instance, a steel wood pad might seem like a great option to get out a resilient stain or buildup of minerals, but this can be damaging to glass. Cleaning the shower enclosure regularly will ultimately make it last longer and easier to clean in the future. 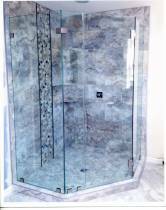 Contact us for help with picking out a shower enclosure or for other information about them. Many Marylanders love to incorporate the feeling of being out on the water in their residential and commercial spaces’ design schemes. And who could fault them for that? It’s hard not to love being at the ocean or places like Lake Centennial. We have found that one great way to create that natural vibe indoors is to include custom made glass countertops into one’s interior design plans. 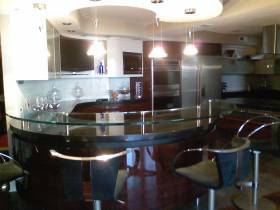 The multiplicity of glass countertops available on the market today is quite staggering and their inherent qualities make them easy to maintain, clean and mount to various surfaces. For instance, some of the countertops are made with pieces of recycled glass and resin. Others are fashioned out of solid slabs, tiles and more. Glass countertops also pair perfectly with unique and exciting lighting options. For example, the glass could feasibly be lit from above, below or the side to give the illusion of movement or sunlight. Some custom designs also allow for lighting to be embedded into the glass itself, which in some ways gives the illusion of an underwater submersible or deep sea divers outfitted with lights. In our experience, blue and green glass countertops are ideal for beach and lake themed design plans. However, it is also feasible to use earth toned materials and translucent glass tops to give the appearance of a shoreline or sandy bottom. We’ve seen homeowners achieve that very look by covering tan colored, opaque glass with blue translucent slabs. The other wonderful thing glass countertops have going for them is their ability to be paired with so many other design elements. For instance, it is not uncommon to see them alongside of back-painted glass, antique mirrors, granite sinks, metal chairs and wooden islands. They’d also work with wicker and Adirondack-style furniture, which is so often incorporated into beach or lake themed designs. To discover more ways to bring the illusion of the great outdoors into your home with the aid of glass countertops, please contact us today. Owning glass table tops doesn't limit you to the possibility of using glass on other items in your home. If you've ever had experience with glass on furniture or just using as giant mirrors, you know how effective they can be in a room. By strategically placing mirrors in certain parts of a small room alone, you can instantly make the room look larger. That's especially true with mirrors taking up the entire space of a wall. When it comes to tables, shelving, and countertops, you can achieve the same effect. You can also use glass to achieve better lighting in an overly dark room if you place the above items in strategic locations. When you have glass on the top of a table, you're already reflecting things around you to give the illusion that the room is bigger. Also, using glass tables near windows can help you reflect light around the room. Placing the glass table near your largest window helps this and becomes very useful when you want to fill a room more with natural light. You also don't have to worry about scratches and dents as you would when you buy a wooden table. If you happen to get stains on the glass while entertaining guests, glass table tops are very easy to clean with regular cleaning solutions. Since glass can't be damaged from these cleaning solutions like wood can, you already have less of a headache in maintaining the table. If you're not into glass tables, you might find a lot of positive uses for glass shelving. They provide the same reflective qualities of glass tables and help make certain cramped spaces look more spacious. They also have more of an appealing aesthetic than the bland wooden shelf look everybody else has. Glass shelves also make any antiques you have stand out more because the glass shelves can look seemingly transparent. This works the same on glass tables when displaying items underneath the table. There, they can be seen, yet protected from any activity above the glass. If you thought glass countertops in your kitchen might be considered too delicate, you'll be surprised at how durable they are and how easy they are to clean. Just like the glass tables and shelves, they're perfect for maintaining without having to worry about maintaining wood or other materials that stain easily. They also endure high heat, which is perfect when preparing food and setting hot dishes on the surface. Aesthetically, it also creates a beautiful look to your kitchen by helping to reflect more natural light. Plus, variations on the glass can be made through different colors and textures. Through all of these glass pieces, you can realize just how effective and efficient glass really is. Here at Hutchinson Glass & Mirror, we provide all of these items and many more glass items for any home or business. Contact us to find out what other glass items we can help design and install for you to make rooms and your life much easier. As a family-owned business, we're here to help you find what you need quickly and install it for you without any hassles. Why not put that bottle of methylated spirits you have in your bathroom, crafting area or workshop to good use? Believe it or not, at full strength it makes an excellent glass cleaner. Pair it with a lint-free, microfiber cloth and you’ll have Heloise perfect glass table tops in no time. Don’t have a bottle of methylated spirits sitting around the house? Then reach for jug of white vinegar instead. If your glass table top is exceptionally dirty, use the vinegar at full strength. For mild messes, feel free to blend it with distilled water. A 50/50 or 75/25 mixture, heavy on the vinegar, should be sufficient in most situations. What’s that? You don’t have white vinegar in the cabinet either? Well, if you have a plastic bottle full of non-sudsy ammonia hanging out under the kitchen sink, that will work too. One word of warning though, at full strength the odor can be a bit rough on the senses. So we’d recommend diluting it with water and opening up the windows for ventilation purposes. For those days when your glass table tops are dotted with candle wax, grab a bottle of Goo Gone or some other citrus based cleaner and a glass scraper. It should remove the mess quite easily. And when you are done, consider running out to buy soy or natural beeswax candles. They both tend to drip very little and don’t stick to glass table tops as much as paraffin wax candles do. To learn more about caring for glass table tops or seek assistance in purchasing a new one for your home, please contact us. Our family has been in the glass fabrication business since 1920. Plus, we are longstanding members of the National Glass Association and the American Society of Interior Design. It is important to enjoy your bathroom as much as possible, and this can be hard for some homeowners to do when sticking with the bare minimum. For instance, a homeowner is likely to have certain preferences for their showering experience, so making sure they are satisfied with glass shower doors is highly recommended to get the best value on a bathroom renovation. 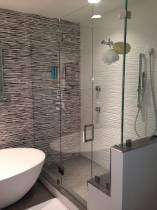 A professional that makes a custom glass shower door can customize your shower door to your preferences. Before doing this, you should learn about cut outs and how you can get a glass hole for something as simple as a door handle, or even for a robe hook when you love to wear robes. If you are interested in the most functional glass shower enclosure, you cannot go wrong with considering mitered glass, door notch, or a Mickey Mouse cut out to create a steam-proof or structurally sound enclosure. If you want something simple and plain, you can go with a square handle or knob table as they look quite standard when it comes to bathroom hardware. However, to go with a Victorian home, you may be interested in a Victorian handle, which will mesh well with your overall style. It is even possible to get a combination that includes a glass door handle and a towel bar, which increases usability. While towel bars and robe hooks have been mentioned already, they are worth considering on their own. It is not a necessity for a towel bar to be meshed with a shower door handle, especially when you have extremely large towels that would otherwise hang to the ground when combined with a handle. It is also worth considering a robe hook as this can be a great option to maintain a warm temperature after getting out of a hot shower and hit with a blast of cold air on your way out. Additionally, you may enjoy shelf brackets as this will allow you to use the space in your shower enclosure to store items for hygiene. 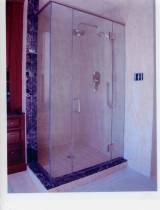 Contact us for assistance with getting a custom glass shower door for your home. Putting together a brand new or renovated bathroom can be an extremely exciting project, especially when you get to the call the shots. It is possible to do this as a homeowner when you renovate your bathroom or construct a new home from scratch, but make sure you know about the options you have to customize frameless shower doors to meet your exact preferences. While some people may think glass comes in one form, there are many different types you can choose from for the shower door of your bathroom. Most bathrooms end up with clear glass, which is great for allowing light into the shower area and allows for simple maintenance. It is an excellent option for homeowners that want their bathroom to look as open as possible. When you get a frameless shower door with reduced iron, you are going to get an appearance that is colorless and even higher in the transmission of light compared to clear glass. Homeowners that are getting a beautiful shower tile should consider this type of glass as this will show the true color from the outside, which can make for a grand impression when entering the bathroom. With a rain-like appearance on the exterior, once you are in the shower, you will find that the glass door is smooth for increased hygiene. It is an excellent option for families where finger prints from children can be quite common in homes. Additionally, you can use this as a way to prevent people in the bathroom from being able to see clearly inside the shower, which is ideal for maximum privacy. Contact us to learn more about these glass types or others that are offered. Minimalists will enjoy this option for one main reason. It has built-in ledges, which allows homeowners to rest their items beside the edge. While it depends on the size of your bathroom, an extremely long ledge mirror can lead to plenty of room for storage while still keeping a minimalistic appearance. Contemporary homes have certain qualities about them, and one of them is frameless mirrors. Going with this option is worthwhile as it generally provides you with the most viewing space. It is possible to have these bathroom mirrors customized to your exact desires, so it can be made to fit from wall to wall, or you can go with a custom design, which has the potential to lead into another style of bathroom. Contact us to learn about other mirror types or to discuss options for your bathrooms. Working at home can be a challenge, and this is because procrastination and self-discipline get in the way. Ideally, you should turn your home office into the best workspace possible, and this should definitely include a glass top desk, which provides numerous benefits. It is not a requirement to have a massive office, especially when most of your work is on a computer. Whether it is an office, dining room, or living room, glass top desks make areas appear larger than they actually are, and this will bode well just about any home office that lacks a lot of space. As opposed to feeling cramped inside a small room, a glass top desk can make you feel like you have ample room. While other materials can be used for office desks, glass top desks are an excellent decision for those that are interested in a modern appearance for their home office. Proper lighting is an important aspect of having a functional work space, and while a glass top desk may not enhance this specific category, these desks can do an amazing job of enhancing the appearance of lighting used for style. For instance, lighting that is below the desk can be seen from above, as opposed to wooden desks where this is not possible. Since offices can vary in shape and size, being able to get a customized desk is crucial. Fortunately, a glass top desk is able to be customized to exact specifications, which means you do not need to worry about fitting a prefabricated glass desk into a completely unique space. It also allows you to get a desk that is ideal for the kind of work you do, whether it includes working with a single monitor, dual monitors, triple monitors, or nothing related to computers at all. Contact us to get a customized glass top desk that works great for your home office. The furniture we loves undergoes significant wear and tear over the years. Spilled coffee can damage a treasured wooden desk; a dropped utensil can scratch an antique dining table. You can certainly protect your valuable furniture with tablecloths and runners, but in doing so the gorgeous wood tones are hidden from view. That's why a custom glass table top is the perfect choice for preserving the condition of your treasured pieces without diminishing their beauty. A glass top provides an elegant layer of protection that actually enhances the look of wooden furniture--especially antiques--and affords you the peace of mind that anything of sentimental or monetary value in your home is protected from damage. Because we do custom work, we can create a glass table top for the unique pieces in your home, including one-of-a-kind end tables, nightstands, and buffets. A glass table top can also function as an essential part of fun DIY projects like homemade, personalized desk calendars. You can trust the experience and professionalism of family-owned Hutchinson Glass & Mirror to listen to your vision and complete the job to your exact specifications. Our loyal customers appreciate the courtesy, conscientiousness, and craftsmanship we bring to each and every job. Contact us to learn more about our wide variety of glass and mirror services, including glass door installation, custom mirrors, glass backsplashes, and so much more. We're happy to answer any questions you might have as you plan your next home beautification project, so don't hesitate to give us a call! Choosing between from a vast selection of countertops available can be a challenge to do. It is beneficial to create a list of the advantages and disadvantages that come with each option, and this is because it will help you narrow down your choices. While granite countertops are very popular in many homes, another option worth considering is glass countertops as they have a number of great benefits. Since glass is non-porous, you do not need to worry about penetration of liquid, which can cause severe damage to other types of countertops. It is definitely an appealing quality, especially when compared to a countertop such as wood that can hold in liquid, bacteria, and form mold when not maintained. It is hard to get easier than cleaning glass countertops. A little bit of soapy water is just about all you need to make sure your glass surface is sanitary. Whether you are interested in this kind of countertop for your bathroom or kitchen, they make an excellent option as these are areas you want to be very clean. Use in the kitchen is not something to be worried about when it comes to heat, and this is because glass countertops can withstand high heat without experiencing any problems. Working with glass gives you so many options in regard to colors, shapes, and even textures. It is possible to keep I very simple and go with a traditional appearance, or you can incorporate some interesting colors into the countertops you choose for your kitchen or bathroom. Glass countertops can be an amazing addition to your home, but you should look at all of the options you have before making any final decisions. If you have any questions, please contact us as we would love to provide you with the assistance you need. Adding sliding glass doors to your home is an easy update for your home to increase its appearance and become more modern. With many styles to choose from, your sliding glass door can fit perfectly into your home's design. Energy Efficient: Your sliding glass door will bring in much more light to any room you add it to without the worry of heat increase. Just because the sun may hit against the door at certain times of the day, you will not have to turn up the air conditioning. The energy efficient glass will resist temperature change in your home. 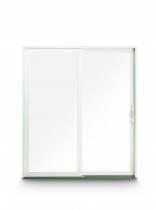 Easy to Maintain: A sliding glass door is simple is design. With just the glass and outside edges to worry about, there will not be many small crevices to keep clean. With the purchase of any glass cleaner, you can keep your sliding door clean and beautiful in appearance. Provides More Space: Since sliding glass doors do not have to swing open and closed, this allows for more space and functionality in the room. You can move furniture closer to the door if needed without having to create space for the door to open and close properly. Safe: Sliding doors are more difficult for someone to attempt to break into. This is because of the way the door locks. Most of the time, sliding glass doors even come with two locks for extra protection. Plus with the energy efficient glass, it can withstand force in the case that someone tries to break it. If you are interested in learning more about adding a sliding glass door to your home, contact us. Our knowledgeable staff can lead you in the right direction of choosing a sliding glass door that is best suited for your home. Sophisticated and unique, etched glass is an elegant embellishment to any home. It can improve any room by ensuring adequate light infiltration and privacy needs are met simultaneously. Another benefit is its decorative quality; whether it is a representational or abstract design, etched glass is a simple and functional way to beautify the home. In particular, there are three places where etched glass is especially effective and attractive. Bathrooms are the perfect environment for etched glass. Many people opt for frosted windows to maximize privacy in their bathrooms. Etchings are a great way to add interest and style to frosted windows with attractive designs like flowers or abstract patterns. Etchings on glass bathroom doors are another luxurious alternative to traditional wooden doors. Many urban homes have at least one window that looks out onto either unseemly street, a building wall, or right into the windows of another home. One way to brighten up that less than ideal view is by distracting attention from the view itself. Etched glass can provide visual relief from the view outside if it is less than satisfactory, or even make a normal window a privacy window. The front door is the gateway of the home. It is also the face of the home presented to the outside world. Etched glass is a great way to project elegance and also screen visitors entering the home. It provides a subtle layer of privacy while letting light from the outdoors stream in to the home. For more information about how etched glass might add some flair to your home, contact us today! Sorting through all of the different shower enclosures available on the market day can literally make consumers’ heads spin. So we wanted to make the process less complicated by using today’s blog post to talk about the advantages that come with installing popular types of shower enclosures. Two styles that we’d like to hone in on first are frameless and framed shower enclosures. Frameless shower enclosures traditionally require the expertise of a glass fabrication expert and the use of architectural-quality glass. Just in case you are unfamiliar with it, architectural-quality glass tends to be stronger, safer, easier to maintain and more versatile than other forms of glass. 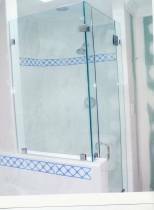 Thus, it may be used to create a wide variety of unique, personalized shower enclosures. Framed shower enclosures, as you might have assumed, rely on a support system. So the room’s architectural elements must work in harmony with the shower enclosure’s exact framework. As for the framework, in most instances, it is manufactured out of metal. Furthermore, the doors may be fashioned out of plastic or thin glass. Subsequently, that tends to make them inexpensive but harder to maintain over time. Of course framed and frameless shower enclosures are not the only options today’s consumers have at their disposal. Some may choose to go with a blend of the two types. The blends are often referred to as semi-framed shower enclosures. They are very affordable and may be crafted in a way that works with unusual layouts. Plus, semi-framed shower enclosures have the potential to look beautiful too. To ask questions and determine which shower enclosures are right for your properties, please contact us by calling (301) 984-7500. At Hutchinson Glass & Mirror, we’ve been installing shower enclosures in and around the Washington, D.C. metro area for decades. In addition, we are members of the Glass Association of North America, the American Society of Interior Design and the Mid-Atlantic Glass Association. Whether you would like to make a drastic change in the appearance of your office or you simply need a new space to work at, it's best to consider the three best reasons why a glass top desk may be the best investment. Not only do these desks look very stylish and modern, they can also make it easier to stay organized and clean due to their streamlined appearance. Durable Enough for Regular Use: When compared to cheap plastic or particle board surfaces, you'll quickly find that a glass desk top can be the best surface to work on regularly. Whether you intend on using the desk to place a computer or you spend a lot of time sketching on paper, it's best to consider how durable glass can be when used for a long time. Fitting for a Variety of Decorating Styles: Whether your home reflects a modern style or you're interested in something a bit feminine, a glass desk can fit wonderfully into a variety of decorating styles. Instead of assuming that your desk is going to look out of place or be the largest focal point due to the glass surface, it's best to keep in mind how unobtrusive the glass can be and the stylish touch it can add to any room. Easy to Clean and Maintain: Glass is recognized as being very easy to clean, allowing you to have a functional work space that can stay in good shape as time passes by. Here at Hutchison Glass & Mirror, we want only the best for your home and the decorating that you decide to do. In order for your office space to be personalized and highly functional for working, it's best for you to consider all of the great reasons why a glass top desk can be an ideal addition to the office in your home. To discuss the different styles of desks that we can help with, or anything else, please contact us. If you're looking for a modern, clean, and contemporary design for your bathroom then frameless shower doors are an excellent way to start. Not only do they keep your bathroom open and airy feeling but they're perfect for making your space look larger and allow you to show off your tile work or custom shower area. These shower doors make it easier to keep your bathroom looking spotless because you don't have to worry about seams or seals that can become dirty from regular use. You get a maximized view with a minimalist approach and will enjoy the sense of space you get with a frameless shower door. The resale value is another reason to consider a frameless shower door because they are very popular with home buyers and help retain the value of your home. We've been in business since 1920 and can create a frameless shower that you want that fits in with any decor and we also include a variety of related hardware so everything is cohesive. We take field measurements, work on the production, and the installation of your frameless shower so that we are with you from start to finish, with personalized service. If you want to learn more about frameless shower doors for your home or any other product we specialize in, simply contact us and we'll be more than happy to help you find the right look for your home. We will give you a complimentary consultation so you can determine exactly what is right for you. When remodeling your bathroom, there are many design decisions that you will have to make. When it comes to redoing your shower, you will have to decide if you would like to install traditional framed glass shower doors, or if you will install the newly popular frameless shower doors. While frameless shower doors can be slightly more expensive than their traditional counterpart can be, there are many benefits to upgrading to the frameless option. Here are just a few of the reasons why you should consider upgrading to frameless shower doors in your bathroom. Another benefit of these shower doors is that they are typically much easier to maintain than their traditional counterpart. This is mainly due to the fact that there are no tracks in which dirt and grime can collect, which is one less thing for you to clean. Furthermore, these tracks that are on traditional shower doors are susceptible to corroding and rusting over time, which can cause them to need to be replaced. Since frameless shower doors do not have these tracks, they have one less component that can fail on you. Perhaps the best benefit frameless shower doors provide homeowners with is that they are truly worth the investment. Installing frameless shower doors in your bathroom will not only increase the appeal of your home to potential buyers, but it will also increase the return you get on your bathroom remodel when you sell your home. From beauty to value, there are many benefits that upgrading to frameless shower doors can provide you with. In every home, there's one room of the house that seems to be everyone's escape from reality...at least for a little while. For her, it might mean a few minutes away from the kids and imagining herself drifting away into a wonderful, luxurious spa setting. For him, it might mean a few minutes of peace and quiet, with a design and a feel that makes him feel relaxed. Your bathroom can be a sanctuary for anyone in your home, but only if it's designed in such a way that it feels relaxing. According to a recent article on the She Knows Home & Garden website, the word relaxation is a major element in bathroom trends for 2014. Here are a few suggestions to help you incorporate a more serene bathroom in your own home. There is something that's simply elegant about glass shower doors. Many homes have opted for a shower that's separate from the bathtub in keeping with a more modern home design. You'll add an element of sophistication by incorporating custom-made glass shower doors to your design. Not only are they beautiful, but they can also make your bathroom appear larger. Minimalistic used to be the trend when it comes to bathroom design, but newer trends are calling for bigger and more dramatic effects in the home. In the bathroom, these effects are especially beautiful. Instead of a small mirror over the vanity, why not opt for a larger mirror that becomes the focal point of the room? Or, perhaps you haven't noticed how outdated your medicine cabinet looks. A new face on it can bring a breath of fresh air into the bathroom as well. Every bathroom has to have a storage solution, but people are often looking for ways to hide their storage areas because they can detract from the attractiveness of the design. Mirrored cabinets can give you the storage you need while adding a lovely accent to the bathroom. These cabinets can also give you the added space you need in the bathroom to keep the vanity and shelves free of clutter. If you're thinking about doing something special with your bathroom this year, we have a lot of great ideas! Our professionals are eager to talk to you about your ideas.